Are you finding yourself seeking friends and a sense of belonging? Searching for new ways to live what might look like a very different life than the one you’ve lead? I invite you to join me in crafting a healthy, loving, creative and abundant life, all within a community of us committed to living what we’ve got with all our heart and soul! 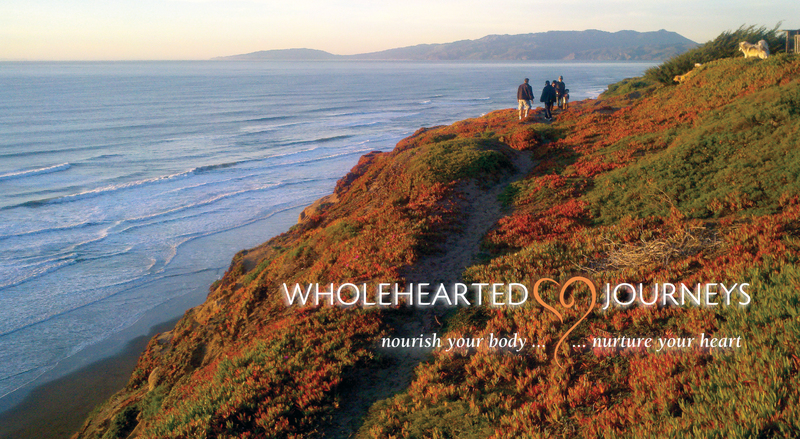 wholeHearted journeys is a savory dive into international food, language & cultures. We will create and cook memorable meals, immerse in cultural adventures and enjoy the friendship and support created by sharing food and life together. All of this happens as we connect & cultivate congruency in our lives through great food, yoga, meditation and community. Our first 5-day cultural immersion will be centered around celebrating Italy! look to participate in creating Italian meals and playfully learning some of their language and culture. We move from nourishing our bodies to nurturing our souls by learning and refining practices of mindful yoga, simple meditation and other holistic practices to begin bringing our inner selves into belonging with our outer world. Consider joining us and experience the community and support cultivated by spending time together making food, sharing life and connecting with our self through yoga and meditation. As we embark on these journeys together, you will be invited to join the private Facebook group of fellow sojourners where you can receive more information and get supported by your new friends. When we travel to Italy, it will be in an intimate group sharing small town and farm settings, re-creating family meals and with the intention of simplifying and slowing down life and our internal chaos. Expand on your sense of what you think is possible… Join us on a journey! I am incredibly delighted to offer my first yoga-based retreat with Andre Houle during the winter high season in Palm Springs! Andre is renown for his dynamic power yoga with a mega dose of love based on decades of experience & physiology. Chef Carrie Grenier will be flying in from Colorado making incredible farm-to-table noshies to replenish you after the yoga. I cannot wait — do sign up for updates if you’d like to be dialed in to the developing details. BEHERENOW.me is my blog (and an indefinable target) that has evolved over the years. A recent post about Unhooking… “I first landed on the concept of being “hooked” just a couple short years ago by Pema Chodron, a woman I consider to be a true teacher. Married twice, divorced, cheated on, had a family, had a career — I knew she was as “real” as me and I readily accepted her earthy wisdom and wry commentary on life. My 40-DAY SADHANA ONLINE PROGRAM is a way to learn and integrate simple daily practices so as to move into each day grounded and centered and ready to become your best self. Starting 1/1/2017! My personal journey in just the last 18 months included a break-up, loss of my step kiddos and no longer living in beautiful Telluride and Loveland, Colorado. The past years took me through nine knee surgeries, bankruptcy and the loss of my first partner of 16 years. yes, there was (is) the pain and suffering, and YES there is growth and sanity now. My gains and gratitudes have added up to more than I can begin to count. In that way that our bodies know, and our egos refuse to listen, i started the journeys of meditation, coaching, therapy, and daily gratitudes, and journaling and sharing and alanon more than two years ago. My consistent and ever-enriching daily sadhana practice continues to grow me emotionally, spiritually, physically and professionally and I begin each day (mostly) at peace, and ready for all of life! I would be honored to help you in transforming your struggles into success through the creation of your own personal sadhana. PHILANTHROPY :: wholeHearted Journeys is partnered with wholeHearted Journeys into Recovery, a for-purpose non-profit venture that serves up life skills to people in recovery from addiction. Recovery from addiction and into wholehearted living is a goal that is near and dear to me. For me, success is a journey that includes good health, emotional stability and growth, energy and exuberance for life, fulfilling relationships, creative freedom, curiosity, material affluence, well being, peace of mind and spiritual pursuit of my divine — in short, an abundant and wholehearted life and lifestyle. I believe in a more spiritual approach to success and affluence… and I desire to bring love to the table of life and experience the process of creation that results while inspiring others to do the same. What you see here is what you get, folks. If it resonates, let’s keep the conversation going. I embrace the wholeness of wholeheartedness, wholeheartedly. I’m all in, because, “We can’t be “all-in” if only parts of us show up. If we’re not living, loving, parenting or leading with our whole, integrated hearts, we’re doing it halfheartedly.” Gratitude to you Brené! welcome to my place in the digital world.